The following group types are not accepted by this hostel: College / University, Business Trip If you have misrepresented the type of group you are booking for, your booking may be cancelled by the hostel." This is a nice homestay in Sheki. The homestay host is Ilgar Agayev – Translator and Guide. He has been working as a translator at the Sheki Silk Company for around thee years, often acting as a guide and interpreter for official guests visting the factory and city. 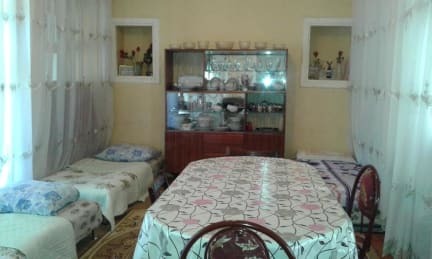 It is a small homestay-guesthouse which has proven popular with foreigners and was selected as one of very few Sheki accommodation options to be listed in the Lonely Planet guidebook. In 2013, it also received a certificate from CBT International as an “Outstanding Host”. 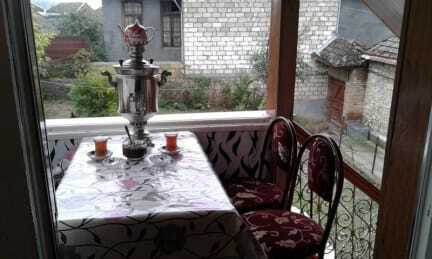 The Guesthouse is located close to mountain area which is close to Khan Palace and restaurand Gagarin. In earlier years, the host trained and served as part of the service personel team at the Sheki Sarayi Hotel, the town’s foremost boutique hotel. Later he was selected by the the American founders of the then-new Sheki Climbing Centre to act the communications and sales manager. His experiences in service and commuication will bring you a nice stay in Sheki. 6. As religious i do not shake ladies hand even from my own religion. 7. Please put on you something while you walk in corridor don't be too much undressed.